Clarify uses an HTML template to format the text that is copied to the clipboard when you select the Edit > Copy Document to Clipboard > Text and Images menu option. This article will show you how to customize the template that is used. If you are not familiar with HTML templates then you should read the manual about HTML templates. The HTML template used in this example can be downloaded below. To add a template to Clarify use the Help > Reveal Custom Template Folder menu option to reveal the folder where you put templates. The Clarify Templates folder will appear. It is locate in the folder where user files are stored for applications. 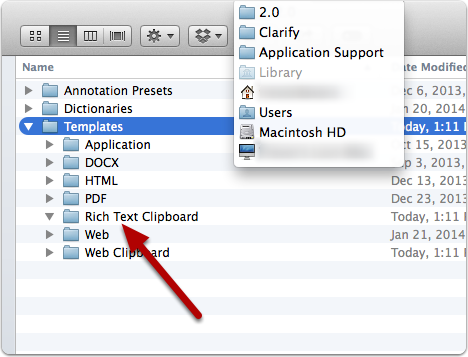 The folder you are interested in is the Rich Text Clipboard folder. If an HTML template folder is placed in this folder, it will override the default HTML template that Clarify uses when copying a document to the clipboard. Here you can see that I have added an HTML template folder named Custom Font. The name is irrelevant as it won't show up anywhere. 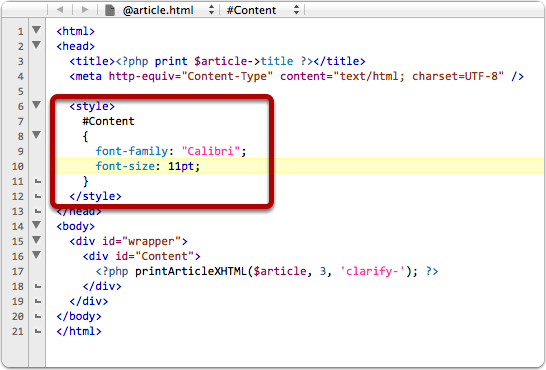 Important: After installing an HTML template you need to restart Clarify in order for Clarify to use it. 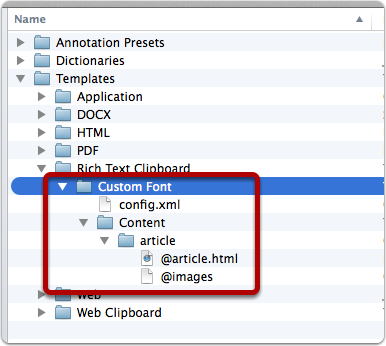 This example changes the font of the text copied to the clipboard to Calibri. This is done by editing the @article.html file and adding some CSS. After installing the new HTML template in the Rich Text Clipboard folder the text that is copied to the clipboard uses the Calibri font.